A legend of Northern Irish football, Gerry Armstrong is best remembered for his historic winning goal against hosts Spain at the 1982 World Cup. He was a very hard working striker who dropped deep and ran defenders ragged with his direct running with the ball and pressing off the ball. Although mainly known for his rugged and direct style of play, he had surprisingly good technique, often beating two or three men in a row with a dribble, best shown in his famous goal against Spain, with his quick dribble setting off the move that ended with him hammering the ball through Luis Arconada's legs. He was known for scoring important goals in general, including winners against Portugal and Israel in qualification for the tournament. After the 1982 World Cup, he joined Mallorca in Spain, and has forged a career commentating on Spanish football. Last edited by StuartBannigan on Thu Mar 14, 2019 6:21 pm, edited 1 time in total. Thank you very much for this work. 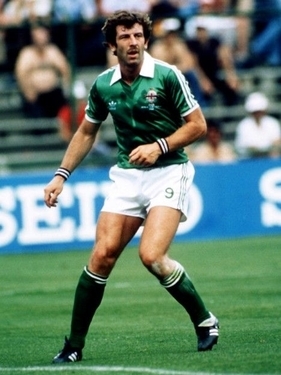 Any chance to have more world cup 82 northern ireland players like john o'neill or david mc creery ? Sure, I’m mostly trying to fill out the All-Star teams, so I plan on doing John McClelland and Nigel Worthington too, I already have some notes on O’Neill and McCreery so shouldn’t be a problem. Last edited by ildeput on Tue Mar 12, 2019 9:20 pm, edited 1 time in total. It's a good start but probably better to do this over PM instead of in the thread of another player.